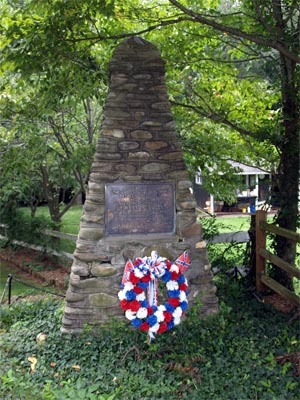 Description: The memorial, on the outskirts of Waynesville, commemorates the location popularly believed to be the "last shot" fired in the Civil War on May 7, 1865. The monument is constructed in a pyramid from local river or field stones and cement. A plaque, most likely of bronze, bearing the inscription in raised lettering is mounted on the front face. Unveiling & Dedication: Mrs. J. H. Howell, then president of the Haywood Chapter of the United Daughters of the Confederacy, led the monument committee. The dedication address was given by Colonel Fred A. Olds. The day also included the assembly of veterans at the courthouse in an attempt to revive the Pink Welch Camp. The unveiling was planned to occur at 11 a.m. at the monument site, reported to be near the site of the "last skirmish in the War between the States" (Carolina Mountaineer). Subject notes: Blanche Smith reported that the monument was located near the old Haywood White Sulphur Spring. Today the area is a residential neighborhood, and the monument sits in the yard of a home, surrounded by a low chain fence. While the claim that Waynesville saw the last shot fired in the Civil War may be unsubstantiated, on May 6, 1865, following receipt of news that Lee had surrendered at Appomattox a month before, General James Green Martin surrendered the Army of Western North Carolina at Waynesville. Martin had assumed command of the western North Carolina forces in 1864. Location: The monument is located on the east side of Sulphur Springs Road just north of the intersection with 5th Street. Landscape: The monument sits hidden in the shade of a dogwood tree and clad partly in ivy. It is located in the yard of a private residence surrounded by a low chain fence.